Cafe Etape is a friendly, local cafe selling tasty, freshly made hot and cold meals and sandwiches with a distinctly mediterranean flavour. The websites creator or author is Bob Stuart / Original design: Andreas Viklund - http://andreasviklund.com/. The web server with the IP-address 217.160.0.188 used by Cafe-etape.co.uk is run by 1&1 Internet AG and is located in Germany. There are many websites run by this web server. The operator uses this server for many hosting clients. In total there are at least 181 websites on this server. The language of these websites is mostly english. 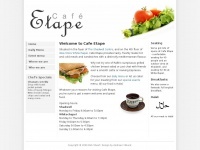 A Apache server hosts the websites of Cafe-etape.co.uk. XHTML 1.1 is used as markup language on the webpages. The website does not specify details about the inclusion of its content in search engines. For this reason the content will be included by search engines.